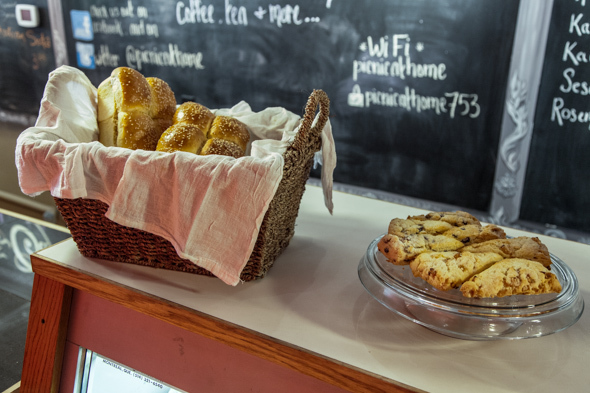 PicNic at Home is a cafe and bakery owned by the same people behind PicNic Wine Bar . The difference here, of course, is that coffee and tea are the beverages of choice at PicNic at Home, and the eats are a little less involved than organic Irish salmon with eggplant caponata. Just two doors down from the wine bar, this new bakery cafe boasts some stunning interior design elements, with one wall clad with mounted coffee sacks and another with chalkboard paint holding the menu. 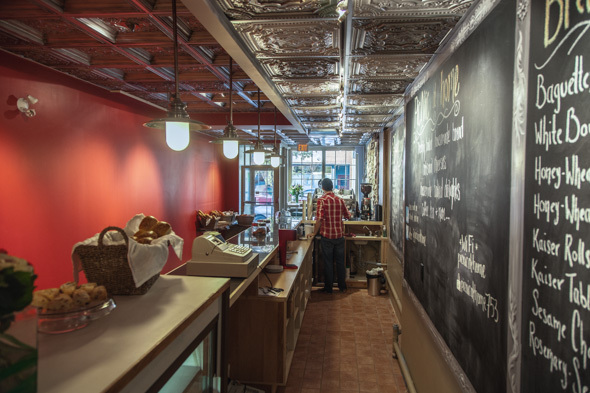 But the best (aesthetic) feature by far is the new tin ceiling, which offers a dramatic change from the drop ceiling of the space's pet store past. 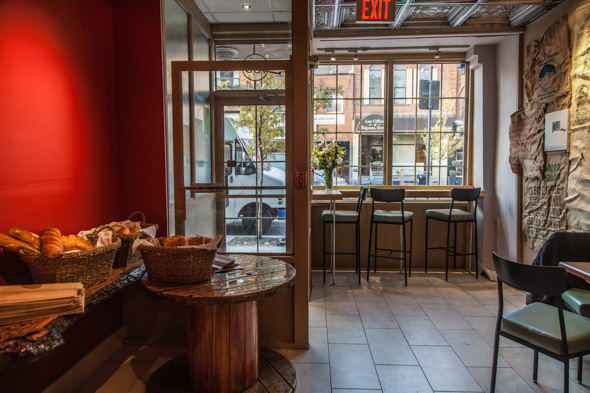 The bakery is outfitted with a few tables by the window and raw wooden floors, with a gigantic live-edge 16-foot wooden table with room for 15 by the back of the cafe. 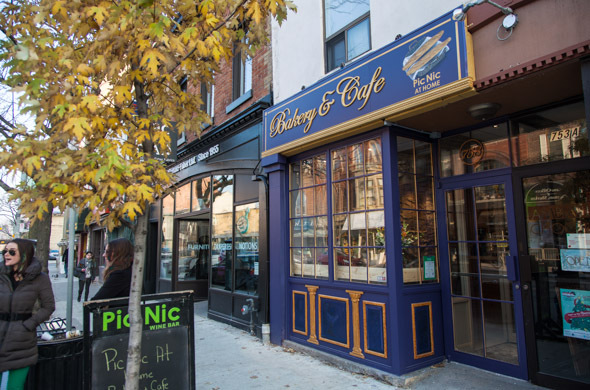 While PicNic Wine Bar has been around for the last four years, the bakery and cafe has been a fairly new concept for owners Seika Gray and Ian Risdon. "It's been in the works for about the past year," says Seika as I chat with her on the cafe's soft opening day. 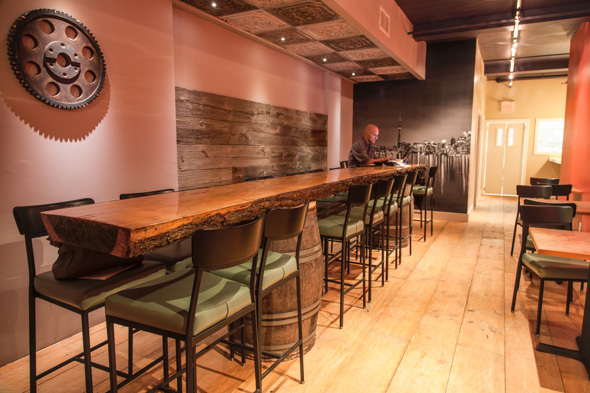 "A big component of the wine bar has been our charcuterie, our baguettes," she continues. "So from there we had the idea to open the cafe." PicNic at Home is still in the process of rolling out its charcuterie, preserves, jellies and more (including brunch, or so Seika suggests). 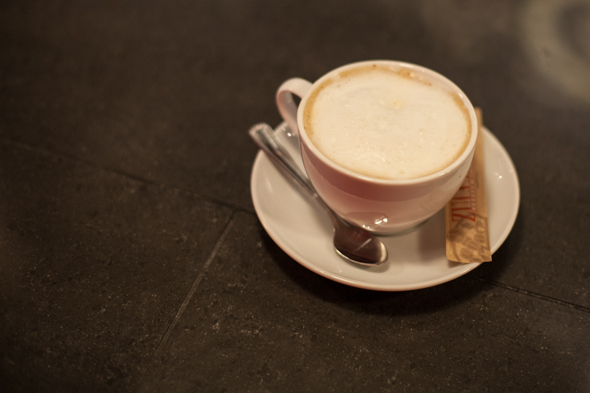 For now, the cafe offers espresso drinks using Patera coffee (espressos $2.50, cappuccinos $3.75, macchiatos $2.75, etc.) a variety of loose leaf teas, hot apple cider, Italian sodas, and plenty of milk options including lactose-free, almond, and soy. On the cheese end, PicNic has started slow with about a dozen options including welsh cheddar ($3.30/100g), pecorino ($4.45/100g), and honey goat cheese logs ($3.65), with plenty more to come. 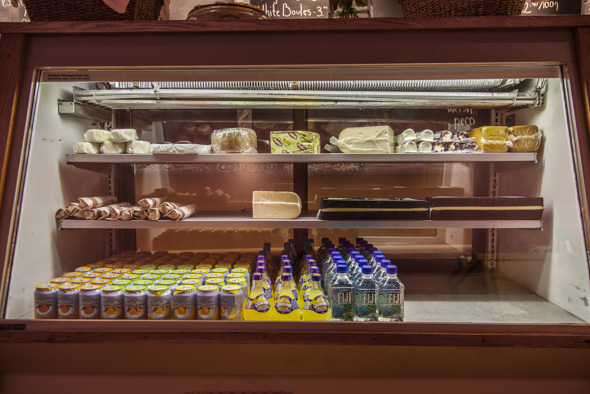 And, of course, there are fresh baguettes, challahs, focaccia and snack-sized baked goods, all of which are made in the on-site bakery. Since Patera Coffee is new to me, I order a macchiato to get the "undiluted" coffee experience (and at the same time, up my writing pretentiousness two-fold). 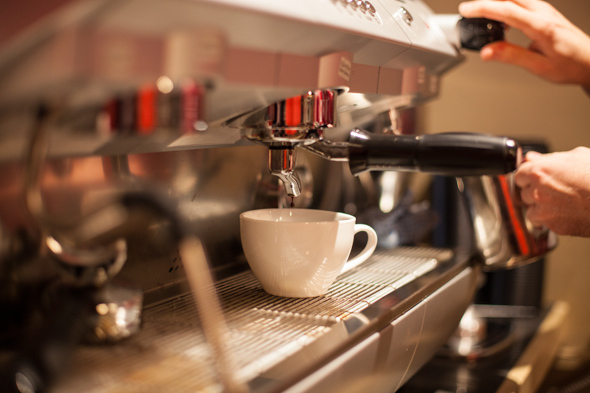 The first sip reveals a bold, full-bodied flavour, with the the slightest hint of acidity on the finish. It's the type of drink that would go well with, say, a smooth Beemster goat — just on the off chance that cheese and espresso becomes a "thing." And maybe at PicNic at Home, it will? If not, the cafe is open until 7:30 p.m. daily, leaving more than enough time to head west for a more acceptable "wine and cheese."